Pour water in a shallow pan (kadahi) and add grated beetroot. Put a lid on the pan and simmer well until water gets evaporated. Add sugar and half of the milk, stir constantly until the mixture achieves a thick consistency. Now add ghee and stir well. Add remaining milk and simmer again for just 1-2 minutes on low heat. Take off heat and garnish with cashew nuts and raisins. 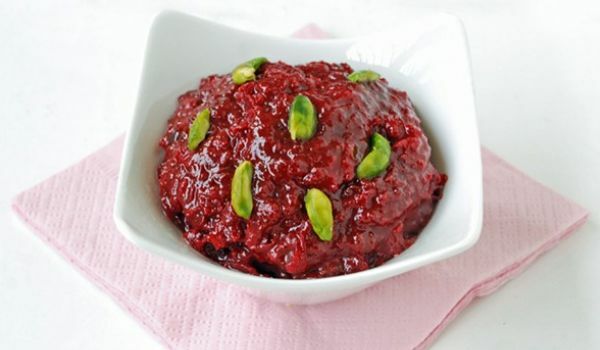 Beetroot Halwa is ready to serve hot. Dilicious..yummy,i have never eat such a yummy dish,trust me.Plese every 1..just try this. Wow, ur recipe made our evening!!! Folks, u shud try this out. Guys the best way 2 surprise ur wife on a Friday evening.